HU. In addition, Graduate Schools were established in 1953. The new HU has risen from the ruins of war like a phoenix, which is in fact the University's symbol. HU has a long history of accepting international students. This commenced before World War II. As of May 2018, HU has over 15,000 students including nearly 1,600 international students from different 73 countries. The Graduate School for International Development and Cooperation (IDEC) was established in April 1994. Our goal is to train experts who can address various pivotal issues for the international society. In particular, IDEC has worked on various challenging issues faced by developing countries through international environmental cooperation, international educational cooperation, and international peace cooperation. These three areas are mutually interrelated, and complement each other. To achieve our goal, IDEC has been accepting many international students. Most of them come from Asian and African countries. As of March 2018, IDEC has 2,062 alumni from 69 countries. We believe it is important to develop international professionals capable of writing academic articles and reports, communicating and conversing in English. Therefore, almost all lectures and seminars are provided in English. IDEC offers special education programs designed to improve the qualifications and skills of students who plan to work in the field of international cooperation. The main features of these programs are as follows. One of our aims is to establish a center for training environmental leaders capable of identifying problems and formulating strategic solutions at national or local levels through interdisciplinary and international perspectives. The global issue of reducing carbon emissions is an example of such a problem and the need for solutions. Another aim is to provide a platform for collaboration between industry, government and academia to promote cutting-edge environmental research and create coherent practical solutions for environmental issues on a global scale that is not limited to developing countries. We seek to provide value-added knowledge to those engaged in international cooperation. Achieving these aims requires addressing five areas: urban system design to prevent global warming, wise use of biomass resources, environmental impact assessment, policy and institutional design and environmental education. Our intention is for developing countries to work hand in hand with Japan to develop international environmental leaders, a task that we will undertake in an effective and practical manner. Developing countries today are facing various difficulties, including rapid population growth, regional conflicts, deteriorating standard of living and environmental problems. Insufficient social infrastructure, particularly in education and medical conditions and technological level, impedes socioeconomic development in developing countries. Therefore, it is of the utmost urgency that we nurture young researchers and planners who are experts in their specialized areas and have willingness to contribute to international cooperation. Through its innovative educational program, IDEC aims to provide educational opportunities for students to learn about the interdisciplinary and practical subjects necessary for international development and cooperation, including economics, environmental science, engineering, ecology, agricultural science, pedagogy, sociology, international politics and peace science. The school as a gathering with international characters offers a special place where the students with different expertise from various countries with different cultural, social, educational, political, and economical backgrounds are able to foster closer ties each other and share the common agenda and goals in international development and cooperation. JDS Fellows will belong to Development Policy Course in the Division of Development Science. The aim of the Division is to nurture specialists who contribute to creating sustainable society in developing countries in social, economic and environmental aspects, namely professionals for international institutions and aid-providing organizations, administrators and academic researchers. The division offers courses on various issues on economic development, socio-political and peace studies, environmental management, infrastructure planning and design, and biological resources development. The courses are designed to provide a systematic and efficient teaching and research by utilizing an integrated approach to the social and natural sciences and methodologies. JDS Fellows will belong to the Development Policy Course. The Course provides the program that consists of three phases: preliminary education (phase I), practical education and research (phase II), follow-up training (phase III). The usual program (for all students including non-JDS Fellows) is also implemented in phase II. In the first year, students will study the basic subjects: Development Macroeconomics, Development Microeconomics, and Econometrics. Through the one-year intensive training on these basic subjects, students will learn the fundamental knowledge and skills necessary for economic analysis. In addition, our coursework is designed beginner-friendly to address practical issues, and not to emphasize theoretical argument too much. From the second half of the first year, students can obtain more specialized knowledge based on their interests, through Development Economics (Economic Development, Economic Development and Policy, Development Finance), Environmental Economics (Global Environmental Policies, Environmental and Resource Economics), Trade and Investment (International Economics, International Trade, International Economic Policy), Private Sector Development (Industrial Development, SME Development, Multinational Corporations). All students are required to join the seminar held by their supervisor every week. Through the seminar classes, student can receive more deliberate supervision and obtain basic skills necessary for academic research. In addition, we provide a wide variety of lectures and seminars including a lecture by a World Bank’s expert, and intensive courses by researchers of the Institute of Developing Economy (IDE-JETRO). For JDS Fellows, we provide the following special program in phase I, phase II, and phase III. Preliminary education aims to make accepted candidates prepare for studying advanced materials in our course through distance education. Candidates are provided with textbooks on basic economics and are required to conduct self-study under the instruction of teaching assistants (Ph.D. students in our course) and professors. Candidates need to submit periodical reports by e-mail and take exams to confirm their achievements. In addition, candidates with low English ability are also provided with textbooks and are required to submit periodical reports by e-mail and take exams to improve their English skills. (i) We provide several opportunities to discuss with specialists from other universities and institutions, and to learn practical knowledge from officers of governmental and international organizations, which would be very useful to build a network of personal connections with professionals. In particular, we hold “JDS seminars” regularly, inviting professionals or specialists from other universities or institutions. The content of the seminar ranges from the latest research findings to general developmental issues. In addition, we actively promote students’ participation to academic conferences. (ii) All JDS Fellows are provided with specialized books, datasets, and/or other materials necessary for their research. In addition, statistical software such as Stata or E-views is also provided for all JDS Fellows. (iii) At least one Ph.D. student is assigned to every JDS Fellow for two years (mentorship system). Students are able to get appropriate advice and ample support on their research from the mentor whenever they want. (iv) We also provide special English language courses, “Graduate Writing I” and “Graduate Writing II.” Through these courses, student can obtain basic skills in writing academic papers. In addition, JDS Fellows can utilize English proofreading by native speakers on their master theses. These practices have improved students’ English skills dramatically. (v) Through the research grant project, we actively promote field research by students. To obtain the research grant, students are required to prepare a feasible research plan. In the filed too, students are monitored regularly by professors, and are able to obtain appropriate advices from them. Until now, several students have conducted their field research and survey with the support of the grant. In order to get feedback from graduates on how they utilize the knowledge acquired in our course and how we should improve the on-going JDS program, we hold a follow-up seminar after students going back to the country. We also provide advice and recommendations on practical issues from the academic view point. In June 2012, we held a feedback seminar in Laos to monitor JDS graduates on their progress in their work place after studying in Japan. We also have a plan to conduct the follow-up training in Kyrgyz Republic. Information obtained from the meeting is utilized to improve the quality of the JDS program and make sure that their knowledge and skills are used in the most effective and suitable ways for their work. In addition to the above special programs, we currently hire a staff in charge of JDS program in order to facilitate the program smoothly and efficiently. Submission of a master’s thesis. All students need to decide research topic and supervisors (one head-supervisor and two sub-supervisors) at the beginning of the first semester. Under the head-supervisor’s advice, students will choose subjects to enroll and start preparations for a master’s thesis. List of subjects offered in 2018 academic year is attached. Students will choose subjects mainly from “Development Policy Course” but also can select some subjects offered by other 4 courses (Development Technology Course, Peace and Coexistence Course, Educational Development Course, and Cultural and Regional Studies Course) as free electives. (1) Under the guidance of the supervisor, the student must take three subjects to be done as required electives. Students who take more than 6 credits as common subjects I･II must consult with their supervisor and include these subjects in categories ‘2’ (subjects specified by the supervisor) or ‘4’ (free electives outside of the subjects specified by the supervisor and may be subjects taken at another graduate school). As a rule, students are to consult with their supervisor on the 12 credits or more they are to take from the list of established specified courses. (1) Students are required to take one seminar as specified by the supervisor. Students are allowed to take a maximum of 8 credits for seminars. Those taking more than 4 credits for seminars must consult with their supervisor and include those credits in categories ‘2’ (subjects specified by the supervisor) or ‘4’ (free electives outside of the subjects specified by the supervisor and may be subjects taken at another graduate school). Students need to decide their research topic and supervisors (one head-supervisor and two sub-supervisors) at the beginning of the first semester. Under the head-supervisor’s advice, students will choose subjects to enroll and start preparations for their master’s thesis. Professors who will cease regular teaching within the standard completion period of the thesis. “Ikenoue Dormitory” (approx. 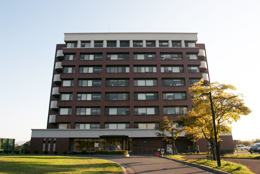 180 rooms for international students) and “International House” (60 single, 10 family units) located on the Higashi-Hiroshima campus are available for international students. The majority of students, however, live in privately-owned apartments. IDEC library has nearly a collection of 30,000 titles of books and journals. Our collection is mainly focused on economics of development, education development, international relations and Asia regional culture development. "World Bank Information Kiosk" is placed for the purpose of introducing active discussions in academic area about the policy and actions of the World Bank. Students can access to "World Development Indicators Online" in IDEC library. Flag ship publications, project reports, brochures and publications from the World Bank Tokyo Office are also available. JDS fellows have full access to 5 other libraries on campus which has approximately 3,300,000 materials in its collection. Holding a huge collection of books and electronic journals, with a total combined area of 29,000 square meters, Hiroshima University Library System comprised of 5 libraries is one of the largest in the country. Within the campus, we have welfare facilities such as various cafeteria, a travel agency office, stores, book shops, a drug store and a barber shop. Hiroshima University also has a post office, a university health service center, and a dental clinic in the campus. The International Center provides mental counseling service to international students in English. The Development Policy Course started accepting JDS Fellows in 2002 and currently we have JDS Fellows from six countries (Bangladesh, Kyrgyz Republic, Ghana, Nepal, Mongolia, and Sri Lanka). We also have students dispatched from governments mainly in Asian countries, under MEXT, Japanese government, the World Bank, and other scholarships. During lectures, seminars, or in student research rooms, students are actively participating in the discussion, exchanging their views and stimulating one another. HU is a research based university. In line with this policy, IDEC requires a thesis for the fulfillment of the master’s degree, which is different from the coursework-based curriculum typically found in professional schools. It is not a very easy task to compile a master’s thesis based on independent research. In fact, students need to spend significant time and resources. However, it is expected that this experience will enable you to acquire specialized academic and practical knowledge in your area of specialization. To ensure that you can pursue research of a high standard that achieves a good result, at the time of joining our course we require applicants to have a good command of English. Some knowledge of economics is also highly desirable. In the campus surrounded by abundant nature in the suburbs of Hiroshima city, you can give your full attention to your study. Your each and every experience here will serve as an excellent base for your further steps as a professional government official. We welcome you to Hiroshima University.